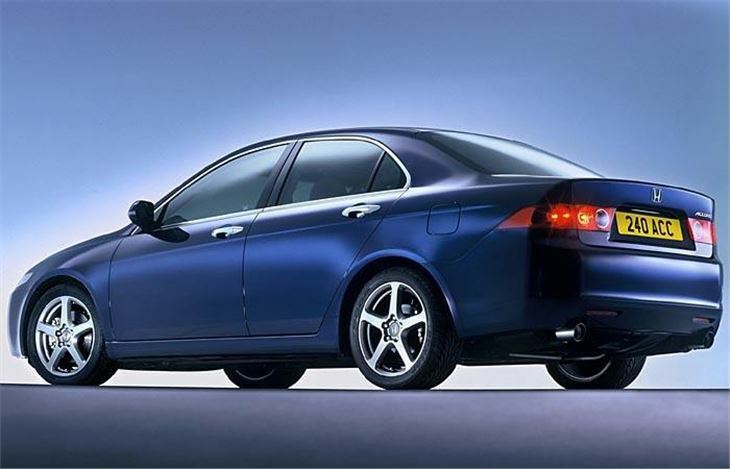 The Honda Accord for 2003 represents the creation of a new market niche. These days, if you make a mass-market ‘family car’ you’re in trouble. Because the mass is moving out of this market. No one spending their own money wants to be seen in a rep’s special any more. Unless, of course, they’re buying it at such a knockdown price they can’t help themselves. They’d far rather have a second-hand BMW or Mercedes. And, if they’re spending upwards of £20k, they want a new BMW or Mercedes. 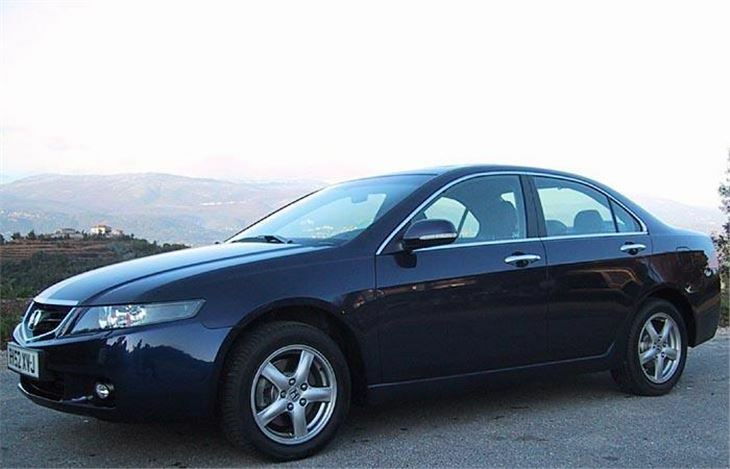 There are a few in-between cars, like the Audi A4, the SAAB 9-3, the Rover 75 and Volvo S60, and, to a lesser extent, the VW Passat and Skoda Superb. But Mondeos, Vectras, C5s, 406s and Lagunas are just too ten a penny to command serious cash. 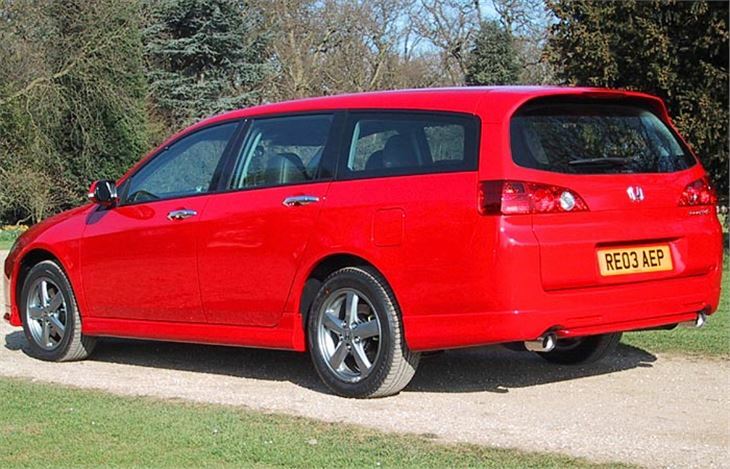 So what do you do if you’re Mazda with the 626, or Toyota with the Avensis, or Honda with the Accord? Instead of making another mass-market runner like the Mazda 6, or a slightly bigger car like the new Avensis, Honda have moved the new Accord up a notch. They don’t pretend they’ve breached Mercedes and BMW territory. And they acknowledge that the A4 is also a different animal. But they’re definitely head and shoulders above the Passat. 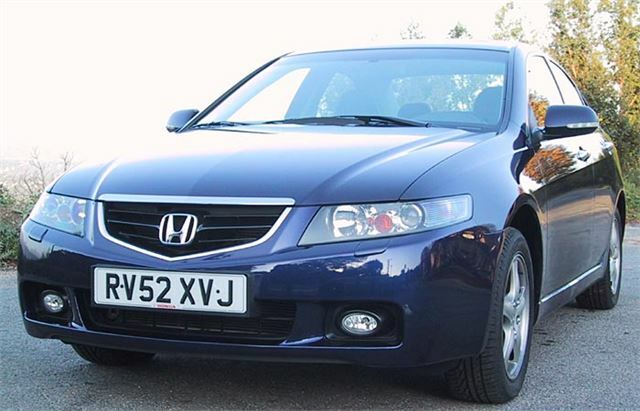 Really, they’ve gone back to where they were fifteen years ago with the 1985 to 1993 Accords: Bigger and better than mass-market fodder, but not quite in the rarified price range of a BMW or a Merc. A bit like where Rover placed the 75 in comparison to the old 600. So have they succeeded? At first the new Accord looks like a slab-sided Mazda 6, It isn’t going to win any beauty contests, whether they’re held in Lagos or London. But at least it has a nice face with front wheelarches that bulge with some well worked-out shoulder muscles. Under the bonnet you get 155 or 190ps and 190 or 225Nm of torque. And you don’t have to wait for that pulling power. Most of it is under your foot from very low revs due to Honda’s clever VTEC variable valve timing. The engines are also quite clean, conforming to EU5 emissions regulations two years early without spoiling the drivers enjoyment. The 2.0 litre gets a 5-speed manual box, or 5-speed Tiptronic style automatic, confusingly forward for upchanges and back for downchanges and opposite to the way Mazda went. But this is a very pleasant, smooth and viceless engine, with no boomy periods, as happy at 50 or 80 as it is at 100mph plus. A lot of drivers who miss the 85-93 Accords are going to be very happy indeed with this car. The 2.4 with 6-speed box has real and usable power. Plus fine handling, good bump absorption and plenty of feel thanks to the light but not too light steering. The 5-speed autobox is also well suited to this engine, though, unless you pre-select the ratio, it can make the wrong decision for you half-way round a corner. The seats are ‘set them and forget them’ superb. Honda has concentrated on ensuring that drivers sit properly, with their bums in a hole at the back of the squab and their thighs and back properly supported. The fact that you don’t have to constantly fiddle to get comfortable on the move is testament to how good they are. Easily as good and maybe better than a SAAB’s or Volvo’s. Steering adjustment is up, down, in and out: the class norm these days. Dash layout is exceptionally clear, with a huge central backlit speedometer, rev-counter to the side and everything else easily visible. Climate control, in-car entertainment and satnav controls fall easily to hand with minimum distraction from the road. And driver and front passenger can control their individual macro climates individually. A great feature of the satnav is that it’s touch-screen, so much less fiddly than these things usually are. Lose your way and you aren’t likely to go flying off the route altogether while you try to reprogram it. Another nice touch is that in all models the driver and front passenger can separately control the temperature around them. Quality is high with very fine shut-lines and doors that close with a quiet ‘plap’ of expelled air. Even the handles are chunky and pleasant to touch. 53% of the body structure is high-tensile steel. Like you did with the 85-93 Accord, you just know this is a well-built car which will never let you down. Back seats? Good, too, with plenty of leg and headroom. Boot? 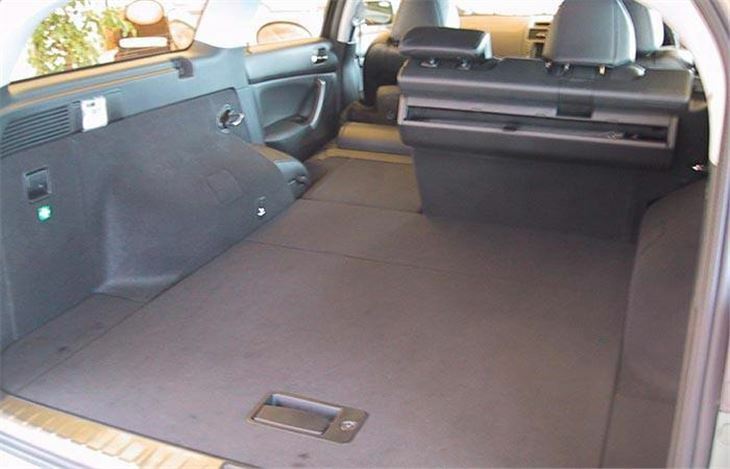 Enormous, with an extra-wide section at the back to accommodate the tallest of golfer’s clubs. There’s also a Tourer station wagon in the UK from May 2003 at a straight £1,000 more than the saloon. For this, the interior designers have taken a few cues from their own Jazz and Mazda’s 626 estate. Press the seatback button and not only does the 60/40 split backrest flop down, the seat squabs automatically jump up and out of the way. This leaves a completely flat floor, lower in the car than in a Volvo estate and nearly two metres long. Despite the low look of the roofline, loadspace inside is actually greater than a Mondeo or V70. So it’s an excellent cargo carrier, surfboard transporter or emergency bedroom. 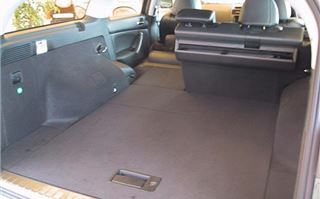 If you don’t go for the £100 spare wheel option, there is a 50 litre lockable well underneath the rear load floor. And the tailgate itself is powered by concealed hydraulic struts with anti-trap and anti-foul sensors so it won’t damage itself against a wall. The Tourer is quite a bit heavier than the saloon as you can see from the figures, and on paper this blunts its performance somewhat. But not on the road. The 2.0 litre is lively in 5th even with the a/c on. The 2.4 Type S 6-speed is quite quick, but its stiffer suspension doesn’t really suit the nature of the car. The 2.4 auto simply gels as the right combination of engine, gearbox, body and suspension. It’s a bit softer than the Type S, obviously. But that helps rather than hinders. And the 5-speed autobox with Tiptronic style back-to-front shift works superbly well with a lovely feel to the chunky, precise shift lever. Later, from March 2004, there will be a 2.2 litre common rail direct injected diesel with 150bhp and 300Nm torque. Finally, safety. It’s not enough to achieve a Four Star NCAP crash safety rating any more. 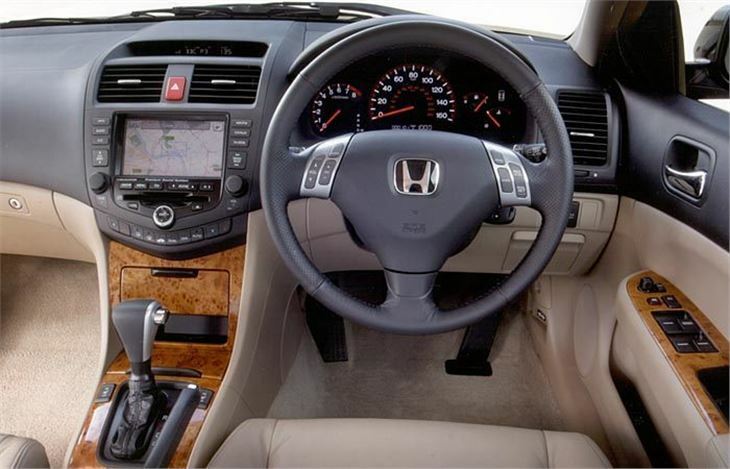 These days, a carmaker has to go for the full Five Star treatment, which, with multiple airbags protecting the interior, Honda confidently expects to achieve. But they’ve gone a step further by considering people outside the car as well as inside. By leaving a space under the bonnet and wingtops they gives pedestrians unfortunate enough to be hit by the car a nice, soft place to land. So Honda can tick all the boxes. 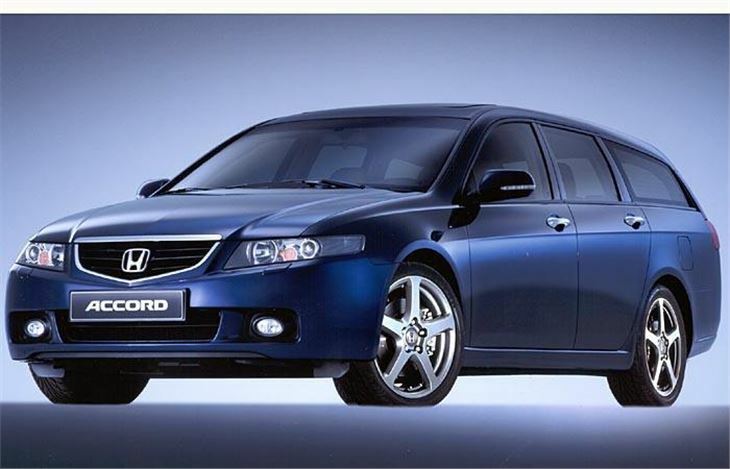 With the new Accord they’ve got out of the mass-market D sector and back to where the Accord used to be. The engines are good to drive and environmentally friendly. The controls are light. The handling is excellent. Noise levels are low. And everyone is well protected. Not bad at all.